If You’ve Ever Wanted To Learn a Sure way To Pass The Police Exam, Look No Further. Right Here, On This Web Page, You’ll Discover a Success System That Will Boost Your Test Score, Build Confidence, and Skyrocket Your Name To The Top Of The Eligibility List … 100% Guaranteed! First… When it comes to passing the Police Written Exam, nobody cares what kind of grades you got in High School or College—and nobody cares if you made the Dean’s List or graduated with honors. It doesn’t matter! Second… If you’re not 100% ready to absolutely “ACE” your police oral interview…or if you’re thinking that just passing is enough to get you hired…you are COMPLETELY misinformed.. PERIOD! The Police Exam is a world of its own—with its own rules. You either learn the rules, or you are VERY LIKELY to FAIL the exam. That means you’re going into the exam with the odds stacked against you before you even show up! It also means that even “good” students flunk the exam all the time. Look, nobody wants to fail the exam because it’s a fact if you pass the police exam and score high on the oral board interview… you’re all but hired. But fail…or pass with just a meager score…and you’re off to break the bad news to your friends and family members and everything you’ve done up to this point is wasted. Why Me? Why My Course? My name is Officer Forestal. I’ve been a police officer for over a decade now. I hold a Bachelors degree in criminal justice and psychology from Defiance College in Ohio. So when it comes to knowing police work AND the best coaching methods available to help you land a career in law enforcement, I got you covered. Using the exact same secrets you’ll find in Pass the Police Exam, I took two police exams from two different departments in two different states. The results? I aced each exam with flying colors and landed the job soon after. Don’t believe me, here’s what other people are saying…. You will learn everything you need to ace the Written Exam and breeze through the Oral Board Interview! I’ll talk more about these in a few moments. Well sure… you can do that! Just don’t expect anything to happen! Police departments all across the country get a constant flood of applications for relatively few openings. So the first task the department has to do is weed out most of the applicants. They do that using the application. In fact, many departments are so busy that they use a computerized screening process to reject applications that don’t measure up. In other words, a whole bunch of people get rejected before their application is even seen by a human! What this means is that filling out the application correctly is every bit as important as doing well on the exams and other phases of the department’s selection process. You must understand that there are many, many things that can knock your application out of the running. Stupid things like misspelled words (there’s no excuse for those!). You cannot treat the application in a casual way. It has to be perfect and represent the best you have to offer. I will show you how that’s done. Oh, one more thing… If your application is rejected, you never find out why! You do not get any feedback that lets you know where you made mistakes so you can fill out the application the right way the next time. But I Can Help You Fill Out the Application the Right Way the FIRST Time—with Pass the Police Exam! One of my friends decided he wanted to be a police officer. He went through the application process and was quickly disqualified. So he went through the process again—but this time he asked me to review his application before he sent it in. I was shocked to see all the major mistakes he had made. I helped him complete his application correctly and trained him for the written exam and fitness test, and finally the oral interview. He aced everything, got on the eligibility list, and eventually got hired within nine months! I can do the same for you! I will walk you through the application step by step and make sure you do not leave any careless mistakes behind—mistakes that will get your application rejected. The application is the crucial first step. It has to be 100% perfect! I will help you make sure it is! How to complete the application so you’ll be noticed (in a good way!) by the recruiter and move to the head of the eligiblity list. How to maximize your chances for a position by knowing who is hiring. How to make sure you show that you have the special qualitiesthat departments want in their officers. They don’t always tell you what they are looking for. But rest assured—they ARE watching you to see if you have these qualities! On To The Police Written Exam! Okay, you followed the guidelines and insider secrets I show you in Pass the Police Exam and have filled out a perfect application. As a result, you have been invited to take the written exam! Now, Pass the Police Exam will be at your side to take you through the next phase. There are a lot of key points you need to know, and Pass the Police Exam covers them all. How to study for the exam in a focused way, so you don’t waste time and stick to the best study material and techniques. I supply you with sample practice questions with detailed answers and explanations that are closely based on the actual questions found on real exams used by departments across the country. You will know exactly what’s waiting for you in the exam room! No surprises with Pass the Police Exam training! I cover key topics including: problem solving; exercising good judgment in various scenarios; verbal abilities; clear writing skills; physical orientation and how to judge direction and distance; memory optimization and how to maximize your observation skills; how to apply mathematical problem solving to real-life situations, and more. Test traps! All the little tricks that are designed to trip you up on your exam. If you’re nervous (which you will be) you are far more likely to get caught by these clever tricks. You need to know what they are before you go in, so they will stick out and you can deal with them properly. How to pick the most likely correct answer when you haven’t got a clue. Don’t panic and don’t just guess! There are tried-and-true ways to do this. I’ll show you how to use intelligent elimination to arrive at the right choice. 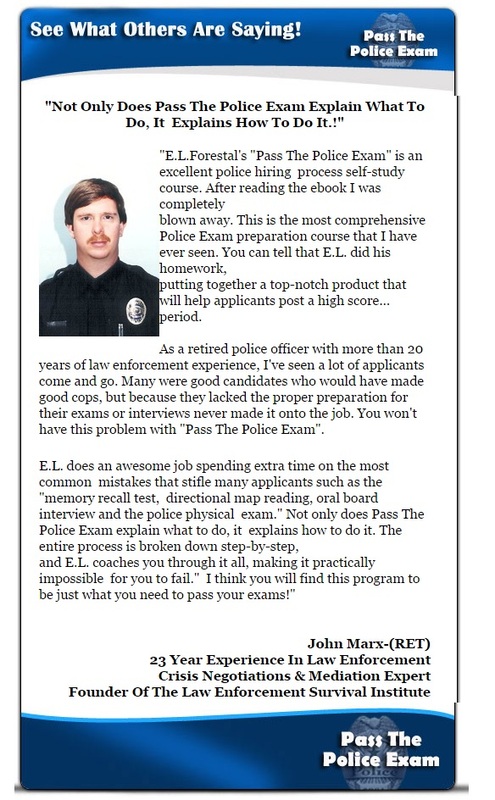 Plus more police test tips, tricks, and secrets that will help you breeze through the exam! On To The Police Oral Board Interview! Unfortunately, the sad fact is police oral boards eliminate more prospective police applicants than all other parts of the police testing process…combined! Trust me if you follow my oral board interview blueprint you’re virtually guaranteed a top spot on the eligibility list. By the way… how much is it worth to you to get all the secrets you need to know to fill out the department application properly, pass the police written exam, and pass the oral board interview? And to guarantee your results! Think about that.. So I Am Including 8 Bonuses At No Extra Charge! These bonuses are designed to round out the entire process—from successful applicant… to candidate… to rookie… to seasoned officer. Here’s exactly what you’ll get plus these 8 BONUSES. Not only will you have the most downloadable law enforcement prep guide on the planet, but you’ll also receive sample test questions that will help prepare you for even the trickiest questions. It doesn’t get more done for you than this. All you have to do is download this book and read it. 1)Prepare for the Oral Board Interview (Valued: $29.99)In addition to the written exam and physical fitness test, you also must pass an oral interview. This can be as tricky as the written exam. Youmust know the secrets of how this phase works, what the interviewers are looking for, what mistakes to avoid, and how to make a good impression that will keep you safely in the candidate process and not get kicked out.Prepare For The Oral Inteview gives you the lowdown on this crucial step. Discover the most commonly asked police interview questions. Don’t be caught off guard! Know what questions will be asked during your police oral exam and your battle is virtually won. 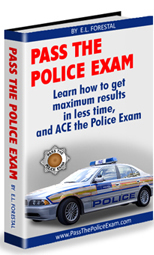 Get the very best answers to even the toughest police oral board questions. Know why each question is being asked and what the police oral board panel is trying to find out by asking those questions. Avoid making common body language mistakes. Police officers master the art of reading body language, you don’t want to send negative cues. Police work can sometimes be like the military: long periods of routine calm, punctuated by short bursts of adrenaline-pumping terror! Of course, a lot of people thrive on that. It’s something that the average citizen never experiences in their humdrum lives. But you must still know how to deal with it and remain in control of your emotions. You must be able to stay focused on what needs to be done right now to survive a dangerous situation. Controlling your fear is the key to this. If you can be the master of your fear, everything else will fall into line and you’ll be able to function as you should. There is no substitute for real-life experience to really teach you how to do this. I’ll share my experience with you so you will go out armed with the necessary tools to stay in control. Unfortunately, even with all the preparation I have included in Pass the Police Exam, there are still some people who suffer from test anxiety. Some of them freeze up. Some of them forget everything they’ve studied. Others get so emotional that they can’t concentrate and start to panic. The end result is that all their preparation goes out the window and they end up failing the exam, which is a real shame. I would be remiss if I didn’t address this issue for those of you who might be prone to test anxiety. I don’t want you to go to all the trouble of studying the information I give to you, only to have a meltdown in the exam room. This bonus book will help you cope with your fears and overcome them. I’m giving you everything you need to get through the selection process and get hired. But that’s just the beginning… You’re not home yet! You still have your professional training to go through—and you can still wash out anywhere along the line once you’re in the police academy. I give you the tips, secrets, and advice you need to make this time as beneficial as possible. If you are committed to law enforcement as a career, you don’t want to just squeak through the academy. Your career will be that much more rewarding if you know how to excel during your time there. I’ll show you how to do that. I see this scenario play itself out all too often. An excited applicant makes it through the hiring process, and then the police training academy, and finally through their rookie year. They are genuinely excited about the work they do. Officer X take pride in his/her work, and it shows in their job performance. Then something happens. They stop caring about their job. They lose that zeal that made them such a good police officer. They got burned out, lost track of what’s most important, became bitterly negative about everything. It’s no surprise that most days they dread going to work. So, what happened to that young officer that was ready to help his/her community. I’ll tell exactly what happened, and how to avoid it. In this report, I will share with you how a positive attitude can influence and motivate yourself and others. Learn some key factors that will turn you into a cop that will continually challenge yourself, one that take pride in his/her work; and who have a passion and desire to grow professionally. Have you ever come across a recruit who met all the credentials to be a great cop, took the physical assessment test, only to fail & be sent home? I have. They were sent home not because they weren’t cop material. On the contrary, they were sent home for being grossly out of shape. Trust me you don’t want to get booted from the agility test center. If that happens to you chances are you’ll have a hard time EVER getting a job in law enforcement. Think about how you’d explain this when you try to apply again. I’ve seen recruits when asked what happened, lie and make up a story. To avoid this embarrassing scenario, I’ve included a fat loss program that will snap you into shape and get you ready for the physical assessment test. Exam and fitness tips delivered right to your email every week! A valuable resource you can look forward to! Keep current with the latest advice for taking the exam. I’ll also help keep you in great shape with weekly exercise and fitness tips—the exact same ones I use as a personal trainer to coach my students. I’m dedicated to make sure you’ll never be “behind the eight ball.” Every time I learn something ground breaking in the police community or fitness related, I’ll pass it on to you. When you come on board and download your police study course, I will be with you for the long term in continuing to find ways to make the program better, more complete, and easier to follow. Every time a new updated version of Pass the Police Exam is completed, you will get it for free! If you are still in the application process when a new version comes out, I won’t leave you behind. You’ll benefit from the latest information. That’s one of the great benefits of e-books… No longer will you have to go to the store and get the new edition, they will be sent to you immediately via email, for FREE! That means you’re covered… for the rest of your life! Don’t worry you’re not going to pay anything close to the $604.75 value of this police study guide. That’s right. I’m willing to slash the price down to make this incredibly powerful information affordable for everyone. Could I charge double or triple that amount? But I won’t do that because I truly want to help as many future cops as I possibly can. For that reason I did everything in my power to get the price down as low as it can be. You Pass the Exam Or You Don’t Pay… My 60-Day Money-Back Guarantee! How many of these so-called “experts” actually filled out a real application and sent it in?I have—and my applications were accepted! Are these so-called “experts” really just wannabes, or are they the real thing? I’ve been anactive police officer for years. I go out on patrol every working day. I know what life as a police officer is really like. Most of the people who put out these programs are just fakes sitting in a cubical or at the kitchen table making up practice tests for the exam. 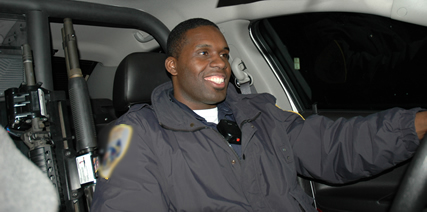 How many opportunities can you find where you are taught by a street-smart, experienced police officer who has the track record and teaching skills to guide you to success? I can truly say that I practice what I preach: I used the inside secrets found in Pass the Police Exam myself and blew both tests right out of the water. And you can too! I’ll show you how. 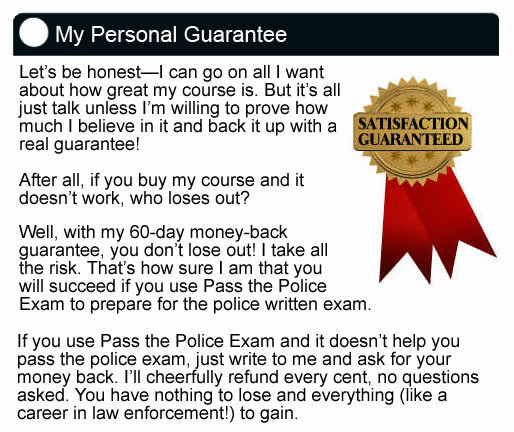 My expertise, my experience, and my skills are all yours—with Pass the Police Exam! You need to give yourself all the advantages you can! Why would you compromise by going with an inferior program? You’ll only hurt yourself and hurt your chances for success. Get the real deal written by the real deal! Okay, What’s the Bottom Line? Remember I asked you earlier how much it is worth to you to get all the secrets you need to fill out the department application properly and pass the police written exam? And to guarantee your results? Have you put a price on that yet? Of course, you also have to ask what it’s worth to not fail the exams! How much is it worth to avoid the frustration and embarrassment of flunking the exams and having to go through the whole process again? Can you put a price on that at all? Well, to bring it down to earth a bit, the entire package of study materials and bonuses are worth $604.75. But you won’t pay anywhere near that. I want to help you start your career as a police officer, and part of that help is making it affordable to get Pass the Police Exam right now so you can jump right in. So, the entire course including the 8 bonuses is yours for only $47.00! And that’s with my60-day money-back guarantee! You’ll spend more than that for dinner and a few beers at your favorite night spot! Think of it… $47.00 to help you start a new career! 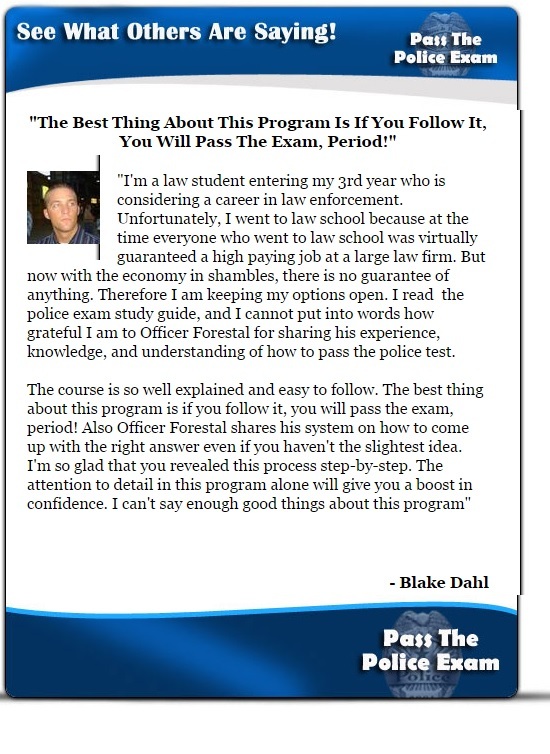 You get the Pass the Police Exam e-book… all 14 bonus reports… and the FREE Pass the Police Exam updates for life – all for just $47.00! This really is a no-brainer! It’s Yours in Just a Few Moments! You don’t have to wait for Pass the Police Exam to be delivered! 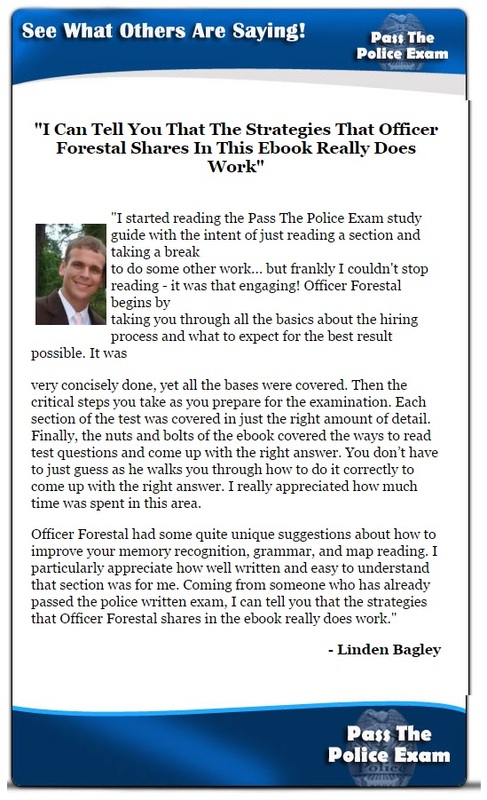 Pass the Police Exam is a convenient e-book in PDF format (there are no printing costs, so we can keep the cost really low!). It’s available for instant download as soon as you complete your order. You can view it right on your computer screen or print it out if you want to. Too many great candidates are needlessly eliminated at the beginning of the process because of mistakes they make that are completely avoidable. It has always bothered me that so many good people—folks who would make great police officers—never get past the first steps. If only they can make it through the initial screening process, their communities will benefit by having them on the force, and they will have a chance to enjoy rewarding careers. I hate to see these great candidates get kicked out of the system prematurely. So I am determined to give them everything I can to help them survive at the beginning—and into their careers. That is why I have created Pass the Police Exam. I don’t want you to be one of those great candidates who doesn’t get a chance to pursue a career as a police officer. I’m giving you that chance! Earlier I said that you need to give yourself all the advantages you can to successfully apply and then pass the exams. That is true. But you must also be honest enough with yourself to know—for certain—that this is the career you want. Police work is a noble profession with a long proud history. But it requires a special person with special qualities. Most people who start the process give up when they fail just one phase of the process. You must be willing to do what it takes to pass the entrance exams and make it through the academy. If you have read this far, my guess is that you are serious about pursuing this path and doing whatever it takes. And that’s the kind of person I’m looking for! I am here to help you reach your goals and join an elite group of men and women serving their community and enjoying an exciting profession that people with routine 9 to 5 jobs never experience. If you are motivated enough… if you are willing to work hard… if this is your big dream… if you want to be set free from boring, commonplace jobs… if you want to be one of the few who make it… then I want to help you do it! Order Pass the Police Exam today! And let me set you on the path to success as a police officer! Please Note: This is a downloadable e-book program. You will NOT receive a physical package shipped to you in the mail. The entire package will be immediately available for you to download and get started right away after ordering. This program is NOT available in stores, so you can only access it through this website. P.S. Don’t delay any longer! People that keep putting off their goals rarely ever get around to pursuing them. STOP procrastinating and making LAME excuses for how you aren’t ready for the police test. Arm yourself with the knowledge RIGHT NOW, and get the info that will help leverage your time and ace the exam. P.P.S This study guide is the real thing. I have poured everything I know about how to pass both the agility test, and the written test. I know this manual will help you and I have testimonials of REAL people to prove it. And with my “no questions asked” total refund guarantee, there’s no risk on your part. You have nothing to lose by at least trying Pass The Police Exam ebook, so click below to order now!